It is a forward-thinking, comprehensive and rigorously researched curriculum with over 30 years of history. It​evolves with the latest research in the field of early childhood education in order to provide educators with information on the best practices in teaching. It is integrated with continuous student assessments, professional development and family connection resources. The approach involves organizing the daily program in a way that is both relevant and exciting forchildren. It supports children’s disposition of being curious explorers with the desire to make sense of their experiences. The framework is applied in each classroom to cultivate effective teaching of preschool children. 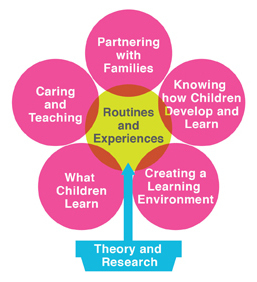 Theory and Research: Grounded in theory and research to ensure developmentally appropriate practice – meaning that the children under our care are taught in ways tailored to how they develop and learn. Knowing how Children Develop and Learn: Blooming Buds understands the social-emotional, physical, language and cognitive growth of children and follows a set list of developmental objectives for each area. We also take into consideration the characteristics that make each child unique, including temperament, life experiences, dual-language learning, and the presence of any special developmental needs. Creating a Learning Environment: The physical environment is setup for routines and experiences in ways that address the developing abilities and interests of different age groups. We organize ourselves by using daily schedules and weekly plans that provides directional guidance while also allowing flexibility within classrooms. What Children Learn: In preparing a foundation for all learning and school readiness, Blooming Buds teachers help children to develop strong social and emotional skills by building trusted relationship with them through positive interactions. To build language and literacy skills, intentional experiences are embedded to enable children to acquire vocabulary and language skills, hear different sounds and rhythms of language, enjoy books and stories, and explore writing. Opportunities are provided for children to explore and manipulate interesting objects in the environment for the purpose of discovering mathematical and scientific relationships. Caring and Teaching: Teachers at Blooming Buds undergo continuous professional training to strengthen their knowledge of child development. In recognizing how children develop and noticing each child’s strengths and needs, teachers at Blooming Buds strive to build trusting relationships, promote children’s self-regulation, respond to challenging behaviors, guide children’s learning and make continuous assessments for on-going individual and group planning. Partnering with Families: Partnerships are built with families through an exchange of information on a regular basis and through an open invitation to be included in all aspects of the program. Routines and Experiences: Inclusive of hellos and goodbyes, diapering and toileting, eating and mealtimes, getting dressed, playing with toys, imitating and pretending, enjoying stories and books, connecting with music and movement, creating with art and craft, tasting and preparing food, exploring sand and water, going outdoors and more. Children Partake in Studies: They learn science and social studies content while developing skills in literacy, mathematics, arts and technology. Science and social studies content include Physical Science, Life Science, Earth and the Environment, Spaces and Geography, People and How They Live, People and the Environment, People and the Past, etc.